Add this to a scene in which has a navmesh or grid based graph, when scanning (or loading from cache) the graph it will be added as RVO obstacles to the RVOSimulator (which must exist in the scene). You should only have a single instance of this script in the scene, otherwise it will add duplicate obstacles and thereby increasing the CPU usage. If you update a graph during runtime the obstacles need to be recalculated which has a performance penalty. This can be quite significant for larger graphs. In the screenshot the generated obstacles are visible in red. Removes all obstacles which have been added by this component. Height of the walls added for each obstacle edge. If a graph contains overlapping regions (e.g multiple floor in a building) you should set this low enough so that edges on different levels do not interfere, but high enough so that agents cannot move over them by mistake. 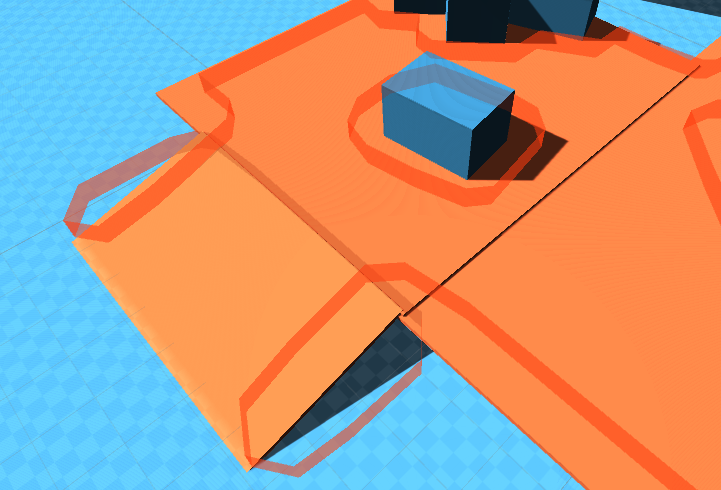 Adds obstacles for a navmesh/recast graph. Adds obstacles for a grid graph. Obstacles currently added to the simulator.